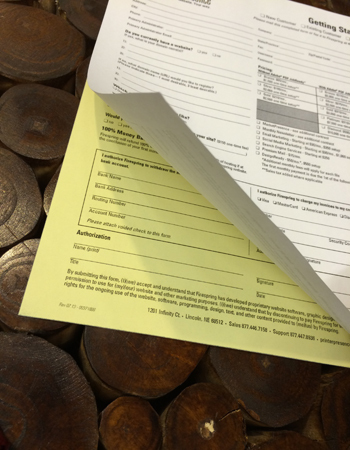 Loose NCR Forms customized for your business! There are many options available, including having a different print on each copy, having your terms and conditions printed on the back of the top copy, additional perforations for tear-off slips, printed covers, hole punching for ring-binders, and more. Please contact us with your specifications and we will happily provide you with a quote. NCR stands for No Carbon Required. The paper is chemically treated to eliminate the old tatty sheet of carbon paper that used to be needed. NCR loose-sets are ideal for anyone that needs to produce instant paperwork when away from the office. We don’t bulk print generic books and put your logo in a corner. Our NCR loose-sets are custom designed to your specific requirements, or you can supply your own design.